Free WiFi access and rooms with a cable TV are featured at Rapids Inn and Suites in Wisconsin Rapids. The Alexander House for art history is an 8 minute drive away. A refrigerator and microwave are included in every guestroom at the Rapids Inn and Suites Wisconsin Rapids. Extras include a desk and fresh linens. Laundry facilities a 24-hour front desk and free parking are all provided at this motel. An array of activities can be enjoyed nearby including golfing. The sustainable cranberry marsh Glacial Lake Cranberries is 26 km away from the motel. An adventure at Wood County ATV Area is a 15 minute drive away. 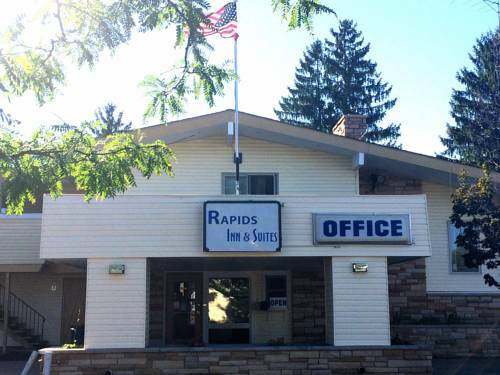 Rapids Inn and Suites is located at 3300 8th Street South in Wisconsin Rapids WI. Neighbors of Walgreens A Dollar Tree and AmericInn Lodge and Suites. In the bloody melee of Dells haunted houses, Ghost Outpost cuts a stylish swath through the competition.